In many telescope rack-and-pinion (R&P) focusers, the base for your finder bracket is molded onto the focuser body. When you replace your existing focuser with a Crayford focuser, you will lose this base to mount your finder. We sell an optional Synta/GSO-compatible dovetail base modified to fit GSO focusers so that you can attach your Synta/GSO-compatible finder brackets again. Thus, you will be able to mount your red dot, multi-reticle, or larger conventional finder on your telescope. Will work with most compatible bracket designs from Celestron, Orion, Synta, Vixen, etc. This will work on most single or dual speed GSO refractor focusers. Installation on GSO Crayford focusers is very easy and one M4 screw is included to mount the base on the focuser. However, it will not work with William Optics focusers which use a larger M5 screw, or the GSO 112mm linear bearing focuser which does not have the 4mm set screw on the body. Also not meant for SCT telescopes which need a wider screw hole spacing. Can also be used with many other telescope tubes. Drilled (but not threaded) to accommodate screws up to 4mm in diameter. Center-to-center screw hole spacing on your telescope must be 18.6mm (0.76") in order for this dovetail base to be compatible. Fits tubes 3.25" and larger in tube diameter (not telescope aperture), as well as flat surfaces. Please see the photos above for detailed dimensions and to determine compatibility with your telescope or finder/finder bracket - we are unable to make specific recommendations about compatibility. Please also note that the hole spacing for the two additional screws along the optical axis (one of which is used for attaching this base to a focuser) is not fixed. Since only one screw hole is to be used at a time, this is not an issue. The base is made of die-cast metal and features a large thumbscrew lock. Includes one (not two) M4 screw. Finish may be smooth black or hammertone gray, depending on available stock. Style of large silver locking thumbscrew may vary. 4.9 (Based on 52 Reviews) 100% of reviewers recommended this product. I needed the extra pair of holes in order to mount this in an unusual way. It was convenient not to need to drill them myself. Perfect fit w/no alteration needed to fit an Orion 9x50 RACI finder. Simple installation to GSO focuser - 3 minutes and shoe and finder we're mounted! Quality item at a very reasonable price. Can't beat the shipping! Agena always comes through. Thanks!!!? Perfect fit for my GSO Crayford Focuser. Using this on a 2” GSO Crayford Focuser for refractors. It fits the radius of the focuser perfectly and locks down tight enough even though the GSO focuser only one has a single threaded hole for it. There is no stop on this one so you can slide a finder shoe in from either the top or bottom. It has the typical 4 screw slot pattern so should line up with about any holes. I bought this on Errol's recommendation. Works perfectly. Fits perfectly on GSO focuser. The shoe that came with my Orion 9X50 RACI did not mount well on my focuser (GSO linear bearing 10:1, also bought from Agena). This is the shoe that Agena recommends for the focuser. I have an Orion 100 refactor and was on the fence about upgrading. As soon as I took this out of the box I knew I had spent my money wisely. It's like having a new telescope. It now adjusts as it should, with the precision this telescope deserves. The adjustments are as fine as they need to be, I could not be happier with my purchase. Buy with confidence; this is the part Orion should have used. I attached this finder base to the GSO focuser added to my 80mm f/5 refractor. It's a perfect fit on the focuser and accepts all Vixen type finder brackets. Really a must have item for the GSO focusers. Works fine on my 90mm refactor. I was a little skeptical of the single screw mounting but went with this bracket as the best option for my GSO focuser on my 120mm refractor. Have no fear; the unit is very well made and the screw provided fits like a glove. The installed base is very stable with one screw. I plan to only use a red dot finder but I see no reason this would not equally support a 9x50 RACI finder. Works great with just one screw, just what I needed for the GSO focuser. this well made bracket will allow you to attach a finderscope to your crayford style gso focuser. This was for a stock finderscope from a skywatcher evostar 90. It fit the finderscope holder perfectly. Even though only one screw holds this piece onto the focuser (an 86 mm gso crayford), it is rock solid. I bought this to attach a finder scope to my Parallax mounting rings. red dot and right angle finders fit it fine. Works well as an adapter to GSO focuser which only provided one screw hole for attaching a viewer. Very versatile with 4 mounting holes. Would buy again when needed. Fit perfectly. No wobble. Stays aligned. Those are the answers to three most important questions. Recommend. You can see it being used on my Youtube Channel. Search: Garnett Leary. Can't mount a finder without a shoe. I'm using this base to hold my StarSense camera. I drilled and tapped the mounting rings on my 120ST. I located this shoe on the mounting rings so the added weight would be near the OTA CG. Does the job just fine. Review by Errol of Trinidad W.I.. I recently purchased this item together with GSO 2" Crayford Focuser for Refractors - Dual Speed (with 96.6mm Telescope Adapter) to replace my rack and pinion focuser on my Meade Infinity 102mm Refractor Telescope. After replacing the focuser with the GSO 2" Crayford Focuser I then attached this Agena style Vixen mount to the adapter and it fitted just fine. I then took my red dot viewfinder and was able to attach it to this mount which fitted perfectly onto the mount. I'm very satisfied with this item and have absolutely no regrets purchasing. Agena was very helpful to me to get me the correct items. Thank you. I have two of these M4 mounting bases for my two GSO Crayford focusers. Both are used on Celestron scopes, one an 80 mm ED refractor and the other on a 90 mm refractor. I also have one of the M5 bases used on a William Optics focuser on an Orion f/5 120 mm refractor. They work great at mounting a standard finder on the scopes. Review by DMM of Midland, NC. Needed a dovetail base and this fit the bill. Good price and fast shipping, as always. Thanks Agena! Review by Jerry of Cincinnati, Ohio. All it takes is one screw (supplied) to install this onto my GSO focuser. Easily holds the 9x50 finder scope I use. Review by The Bus Driver of Bloomington, IN. This mounting base does just what it was designed to do, which is hold my red dot finder after I replaced my rack and pinion focuser with a GSO Crayford. I am not alone in thinking that the one screw would not be enough to hold it in place but it does! It feels very secure with no wobbles. Also, it has a very nice fit and finish. For such a lowly piece of hardware it is really nice. Review by RMS of S.F., CA. 5.0 MUST HAVE if you upgrade your focuser! If you upgrade your stock R&P focuser to a GSO dual speed, this is a MUST to mount your finder. Fits well, quality construction and comes with mounting hardware. Review by Jay of Rockland Co., NY. worked well with my GSO linear bearing focuser. I was worried that the base might interfere with some of the screws on the focuser. I called Agena and left a message 20 minutes later they called back with all the info I needed. Where else can you get service like this? Awesome! Review by Professor Morrison of Montgomery, AL. Does the job as advertised. It is self-aligning and only required a single screw (included) to keep in place. I'm a hard-core astrophotographer, so I need something to hold my autoguider and this mount is a perfect fit for the GSO focuser I used to replace the one on my Orion ST-80 refractor. It does exactly what it is supposed to do. Get two and you can mount a laser pointer and a finder scope on your GSO focuser. Review by olddogg60 of Homedale, Idaho. 5.0 Just the thing I needed. Just what I needed after I replaced my original focuser with a GSO Crayford focuser. Review by Nick K of Near Austin, Texas. A nicely made dovetail base with which to add a finder to the GSO Crayford focuser. Review by inline_phil of Brooksville, FL. I use this to mount my laser pointer on my Celestron 6" refractor telescope. With its solid design, realignment is rarely needed and setup time is therefore minimized. This laser then allows me to move the scope quickly to the part of the sky I wish to observe and locate an object without the finder scope. Review by Hazilim of Phoenix, AZ. This clever add-on provides a mounting base for the finder scope. Instructions are included. For astronomical use, when a finder is needed, this is an essential item. Review by chris of Willoughby Ohio. The "finder base for crayford focusers" is -- well, pretty self-explanatory. I bought a crayford-style focuser to add to my Orion ST-90 (a nice little scope with a mediocre focuser and even worse finder mount). So, with a nice new crayford focuser I needed (you guessed it) a focuser mount. This little unit is similar to any add-on finder base you would add to SCT but additional holes drilled so it fits onto the crayford base. Using only one screw, it still is very secure. Easy to use and stays in place. Like some others, I bought this for a GSO focuser. Works great. I have several Orion bases, but the center screw modification on this one is a nice touch at a better price. Review by Sonique of The Netherlands. Easy to mount on different telescope' so it is universal. You can't get wrong with this base. Easy to use with brands like: skywatcher, orion, celestron, meade etc. Review by Aeromoe of Arizona. I bought this bracket for the GSO Crayford style focuser I recently purchased from Agena. This mount is very easy to install: remove one set screw from the focuser housing, position the bracket and secure with the included machine screw. This bracket is probably the easiset way to mount your Orion-style dovetail base finder scope to a GSO although there are probably other methods one might use. I figured I'd just do what is recommended and it was an easy install. Review by did33 of Latvia. Review by DAS of Virginia. Purchased this base along with a dual-speed GSO Crayford, and GSO 8X50 RACI finder for my Orion ST120. The fit and finish of the base was excellent, as is its ability to securely hold the finder scope. Very pleased with this economical alternative to the brand name items. Review by etiqi of Girona, Spain. It is exactly what I wanted: cheap, strong and easy to use. This is a nice permutation of an existing product. It does exactly what it is supposed to do in the mounting of a finder bracket to a Crayford focuser. It is simple and efficient in design and is aesthetically invisible. The only problem I had with this one was that the finish was a bit banged up, but I knew this going in, the price was adjusted accordingly and a little black nail polish did the trick. Review by jwull of Memphis, MO. 4.0 Just what I needed! This was just what I needed and it works great! When ordering my GSO 2-speed Crayford focuser from Agena AstroProducts recently, a discount was offered if the Agena Finder Mounting Base for Crayfords was also purchased. Well, I love a deal, so I ordered one. The Finder Base has been modified with a couple of extra holes to utilize the pre-drilled holes in the GSO Crayford. A couple of M4 screws are supplied to secure the base to the focuser and one screw does a good job with no lateral movement. The finder that came with my C80ED fits the base perfectly. I will, however, need to fabricate an adapter for my Rigel QuikFinder to fit. The Agena Finder Base is a nice, low cost addition that serves its purpose. Review by cosmic109 of Georgia. When I purchased my GSO Crayford Focuser for refractors, I also acquired an Agena Finder Base that had been modified to fit the focuser using only one M4 screw. In fact, only one screw is actually needed to make a solid connection with the focuser. Trust me, it doesn't move once tightened down securely! The base does exactly what it's designed to do, and gives you the option of mounting the type of finder of your choice, as long as it has a Synta/Orion dovetail design. It's an inexpensive way to expand the capabilities of your GSO Crayford focuser. Review by Tom of Reno, NV. This little mounting base allows owners of GSO style focusers to easily mount an extra finder accessory. Follow the link to the very complete installation instructions provided by AgenaAstro. You can install the base in under five minutes. Since the base installs with only one screw, I had some concerns about its stability, but once in it's rock solid. An elegant and inexpensive solution. Simple, well made and it works. I purchased a pair of Agena AstroProducts Finder Mounting Bases for Crayford Focusers to mount a red-dot finder and an 8x50 finderscope to my GSO focuser. The bases are designed to accommodate any finder with the now common Synta-style finder bracket. The Mounting Base is black-anodized cast-aluminum and looks like it was originally made with a pair of side-by-side mounting holes. 2 new holes were drilled and countersunk in a front-to-back position for mounting on a Crayford focuser. At first I was skeptical. GSO's Crayford focuser is designed so that the finder mount can be attached with only one screw. My initial thought was that a single screw is not enough to keep a finder mounted parallel to the telescope. The Finder Base has two small ribs on the bottom, however that insure that it will always remain properly oriented without slipping out of alignment. Agena's Finder Mounting Base has a very large oversize thumb-screw to hold onto a finder bracket. The size of the screw head makes it very easy to tighten and loosen. 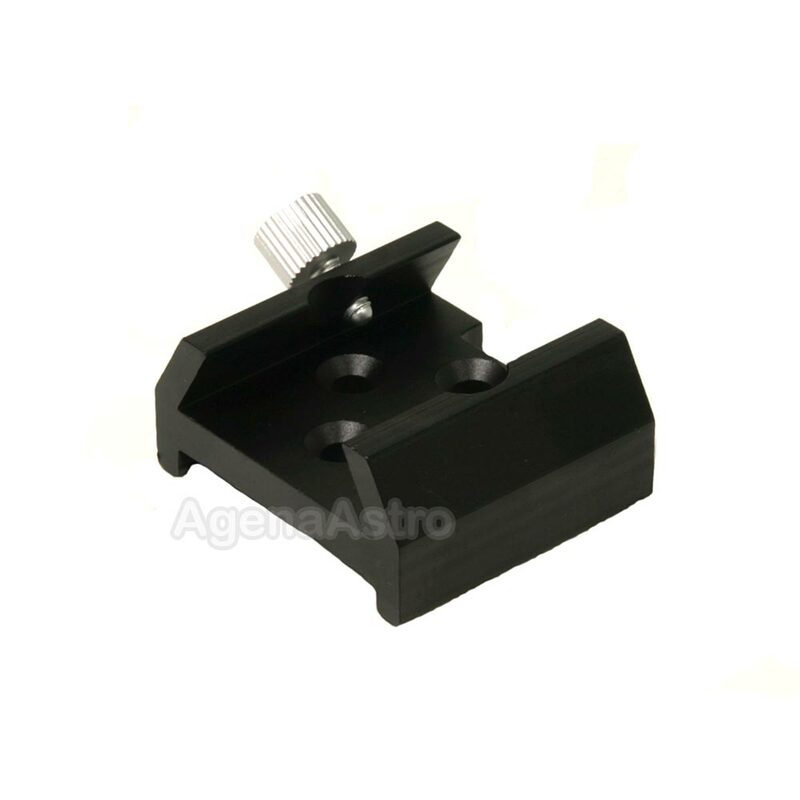 In conclusion, Agena AstroProducts' Finder Mounting Base for Crayford Focusers is well designed and well made and is perfect for mounting a finder on a scope without a bracket for one. When ordering my GSO 2-speed Crayford focuser from Agena AstroProducts recently, a discount was offered if the $15 Agena Finder Mounting Base for Crayfords was also purchased. Well, I love a deal, so I ordered one. Mounting holes are predrilled; Mounting screws are included; Inexpensive. When I purchased my GSO Crayford Focuser for refractors, I also acquired an Agena Finder Base that had been modified to fit the focuser using only one M4 screw. In fact, only one screw is actually needed to make a solid connection with the focuser. Trust me, it doesn't move once tightened down securely! The base does exactly what it's designed to do, and gives you the option of mounting the type of finder of your choice, as long as it has a Synta/Orion dovetail design. For only $15 shipped, it's an inexpensive way to expand the capabilities of your GSO Crayford focuser.